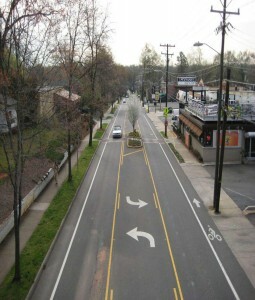 East Boulevard in Charlotte is a commuter route with approximately 16,000 to 21,400 daily motorized vehicles. Prior to this rightsizing project, motorists often traveled at high speeds along this corridor. It runs through a historic district, and connects retail, cafes, offices, housing, and a regional park. A neighborhood plan adopted in 2002 called for making East Boulevard a “main street,” to reduce high travel speeds, to make it easier and more comfortable to walk along the street and safely cross the street, and to improve bicycling conditions. The changes helped address the street’s high travel speeds, high levels of bicycle and pedestrian accidents, and high number of rear-end and left-turn collisions. East Boulevard was transformed in three phases, which totaled 1.5 miles. Phase I was implemented in 2006, and Phase II was completed in 2010. Following these phases’ success, Phase III, which connects I and II, was completed in 2011. Phases I and III were both four lane to three lane conversions, that included a two-way center lane for left hand turns, 5 mid-block pedestrian refuge islands, and bicycle lanes. Phase II converted the road from five lanes to three lanes including a two-way left turn lane, 12 total pedestrian refuge islands at all intersections, curb extensions to shorten crossing distances, and bicycle lanes. 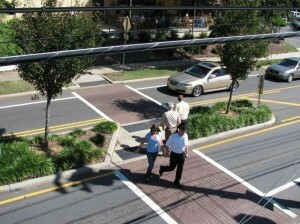 Intersection crossings in Phase II were reduced from 70 feet to only 17- 28 feet between the curb and the refuge islands. Phases I and II included significant pedestrian refuge island landscaping to help bring the “boulevard” back to East Boulevard. Replacing the tree canopy was an important design element for the community. All three phases were designed to increase pedestrian sidewalk activity, and to enliven the street with sidewalk cafes and encourage outdoor seating. Travel times in the corridor remained constant for Phase 1 and Phase 2, while the 85% speed declined from 43 to 40 miles per hour. The posted speed limit is 35 miles per hour, and prior to the changes some vehicles were traveling at excessive speeds (50-70 miles per hour). Average daily traffic declined from about 20,500 to 17,500 vehicles in the Phase I area, and increased from about 18,600 to 19,700 in the Phase II area. Outdoor dining significantly increased along the corridor after project implementation. 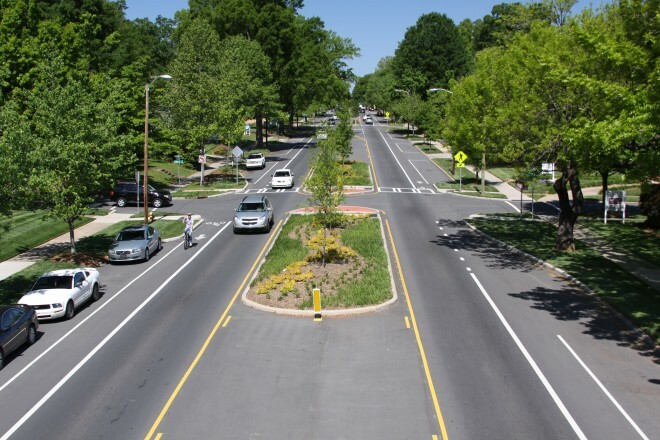 After Phases I and II were implemented, 77% of people in a public survey voiced their preference for implementing a 4 lane to 3 lane road diet in Phase III. Survey respondents touted the increased safety of the road for drivers, bicyclists, and pedestrians. This rightsizing project was introduced to the community as a way to achieve their already stated goals for East Boulevard. Each phase was introduced in response to strong community support affirmed via surveys and public meetings. “Synchro” traffic simulations were performed by Charlotte DOT to confirm that the 4 to 3 lane conversions would have minimal adverse impacts prior to implementation. 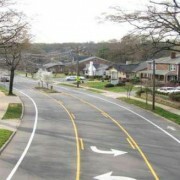 Corridor redesign improved pedestrian and bicycle infrastructure connections to bus routes and light rail, and helped to reconnect the neighborhood landuses.